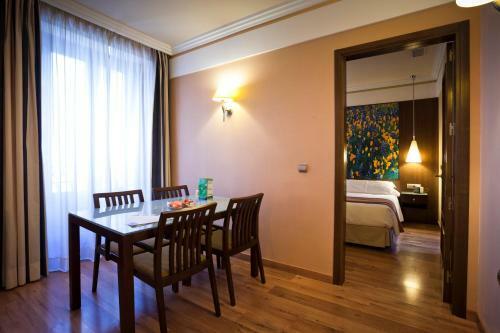 The Apartments have one or two bedrooms, this is perfect for traveling with children. The kitchens are fully equipped. There is a Flatscreen TV in every room. At Suites Gran Via 44 you are right in the centre of Granada. We are 500 mts from the Cathedral and the Royal Chapel. We have a parking lot. Featuring free WiFi, these colourful suites are situated in a 19th-century building, from Granada Cathedral and the Capilla Real. The Suites Gran Vía 44 offers private parking. Each suite at the Suites Gran Vía 44 is at least 38m² in size and has a flat-screen TV and bright, unique design. Offering independence, all come with a fitted kitchen with microwave and kettle/coffee maker. The property also offers a shared lounge with TV where guests can watch free movies or read a book. Fitness equipment can be requested in suites, free of charge. A range of à la carte breakfast options can also be served in suites, from 07:00 until 10:30. There is also a 24-hour front desk service. The Suites building is located on the historic Gran Via de Colon. A frequent bus service runs from this street to the Alhambra and the Albaycín neighbourhood. This hotel is 1578 metres from the Alhambra entrance, 539 metres from Plaza Nueva (the absolute centre of Granada), 1057 metres from the train station and 2454 metres from the bus station.